Nigella’s new book provides my husband’s favourite home-cooked meal – ever! Ah the bliss of the autumnal and pre-Christmas foodie book releases! This year is a particular treat: not only is there a new Nigel Slater, but Ottolenghi’s Sweet is just FAB and of course, Nigella Lawson has released At My Table. My love for the one and only domestic goddess Nigella Lawson isn’t something I have hidden from this blog! From her first book How to Eat, I’ve admired her wit, knowledge and her ability to come up with an absolutely amazingly tasty family meal. I turn to her books more than those of any other famous chef / cook. Every time I have made her American breakfast pancakes from Domestic Goddess for anyone, they have requested the recipe. And that’s just one example. Reviews of her new tome At My Table have been hugely positive, many fans harking that it marks a return to form. Personally, I have always tried to contextualise as far as the release of the books are concerned. Simply Nigella may not have been up there with her greatest hits, but she’d just been through something incredibly difficult in her personal life (again), and it smacked of someone’s search for something. And I understood the pink and green obsession. Anyhow, enough of my armchair analysis. I would agree that At My Table is classic Nigella. I took it to bed, read it thoroughly, covered it in post-it notes, made my list of new bits I’d need (coconut milk yoghurt, black venus rice, aleppo pepper etc) and I had made 3 of its evening mains in the first week I owned it. One in particular was a stunning hit! Having not previously given my Nigella seeds the attention they deserved, I thought we’d give the Indian-spiced chicken and potato traybake a go. Obviously any working parent loves the word traybake, implying as it does a minimum of mess and a minimum of fuss. Its blend of spices also included lots of things I already had there by the kitchen counter waiting for an opportunity to shine, including fennel seeds, mustard seeds and rapeseed oil – sad culinary dreamer that I am, I’d recently treated myself for my 40th birthday by buying a bottle of the gloriously golden Leckford Estate oil from Waitrose. Being Northern Irish, I always have potatoes in the house, so we were sorted on that score. We’re also budgeting hard at the moment, and chicken thighs, treated right, are tasty and affordable. We just needed a few limes and we were good to go. When my husband returned from work, made delighted noises and swiftly wolfed it all down, he declared that it was the best thing I had ever made for him. We’ve been together for 14 years and I’ve been cooking for him all of that time, so that’s quite the statement. It really was delicious, so full of flavour and so, so satisfying, yet so simple. I know already that it will become a regular fixture, as will the chicken and pea traybake (divine!) and the orzo and meatballs. I’m looking forward to tucking into them, and more from the book, as the autumn and winter progress. Nigella, you’re still – and you’ll always be – my queen of the kitchen. We moved into a larger home earlier this year, one which has made it possible for us to finally have a go at producing our own veg. I have tried to instil a sense of the natural world and how it relates to food in our older daughter in little ways here and there. She’s autistic and a very fussy eater, so I figure that we’ll try anything to get her to open up that reluctant mouth to give something new a chance. As we’re clueless when it comes to gardening, we’ve made quite a number of mistakes this first year. We didn’t give our seedlings enough room, so none of them had a chance to grow properly. Our radishes were a total disaster, and we had to act to save the carrots, too. In addition, I don’t think our soil has been of the best quality, so we’ll know to feed our plants and nourish them a bit better in future. Luckily my dad visited in time to save some of our lettuce seeds by repotting them, so we’ve had a nice mini crop growing at the back door. However, as my main aim was not to feed the family but to educate our fussy miss, I think we can say it’s been a bit of a success. Earlier today, we collected some (tiny!) carrots and I set our daughter to task washing and prepping them for lunch. She got stuck in – anything to occupy a wee person is invaluable in the school holidays – and we decided to prep a few of our salad leaves as well to make up a bowl to accompany her lunch of cheese sandwiches. I introduced her to salad cream (I am unapologetic about how much I love it) and tried to busy myself around the kitchen while she was eating so I could carry on pretending it was no big deal. She ate the lot. Time will tell if it was a one-off novelty, but I am hoping not. On this evidence, the rubbish gardeners are going to carry on. Being strapped for cash, I try whenever possible to cook with what’s in front of me in our fridge and cupboards. 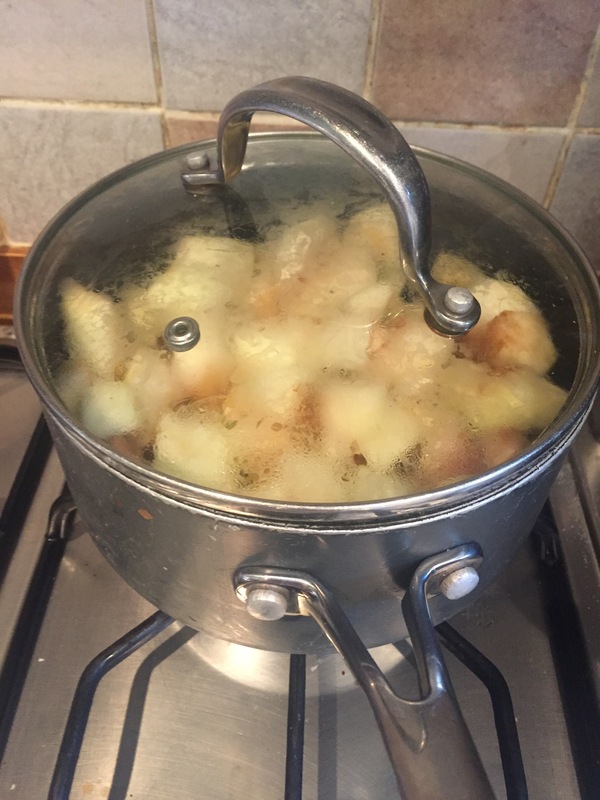 Even if what I’m cooking demands a certain something, I might try instead to think of a way to replace / omit it rather than have to dash to the shop or re-plan the whole meal completely. Cooking like this is, I’m sure, pretty common, and it’s also a good way to come up with something a little bit different. And so it was last week, when I optimistically found myself with salad ingredients including romaine lettuce (the weather betrayed me, yet again) and some cooked chicken. I took a glance around, spotting parmesan, olive oil and white wine vinegar and thought, yup, a sorta chicken caesar it is. Then I came upon my stash of loaf heels in the freezer, you know, the thick ends which no-one in our house will eat. I tend to keep them for making breadcrumbs and I end up with quite a few as we go through a lot of sliced bread. And I thought, croutons? Yup. Why on earth had I gone this long without making my own? Surely it couldn’t be hard. It turned out to be brilliantly simple, and I will never buy croutons again. I simply preheated the oven to 180 degrees C and took out 3 frozen heels and left them for about 20 mins on the side to defrost. I removed their crusts with a v sharp knife, gave the birds the crust crumbs, and then cubed the bread – about 2/3 cm. I tossed the cubes (quickly, otherwise the bottom ones end up saturated) in approx one tbsp of olive oil per 50g. I’d added some crushed garlic and a little bit of dried thyme, too, and obv the possibilities are endless: you could add crushed chillies, dried herbs, whatever would croutonly complement your recipe. After 10-15 mins, they were ready, so I left them on the side to cool while I assembled everything else. followed by lots of nice big chunks of cooked chicken (I’m a real fan of Asda’s £5 extra tasty bagged roasts) which I scattered liberally under and on top of the leaves. Then it was time for something super-tasty, some smoked pancetta slices, which I had dry-fried and crisped up on the griddle. For the dressing, I got a suitable bottle and shook together olive oil, a clove or two of crushed garlic, two anchovies (I mash them in my pestle and mortar), 2 tbsps grated parmesan, black pepper and some white wine vinegar. A liberal casting of the croutons and a generous drizzling of the dressing later and it was all done. Very simple and very tasty. It has been a while, that’s for sure. When I first started this blog, it was as a bit of fun after a rough few years after the birth of my first daughter. 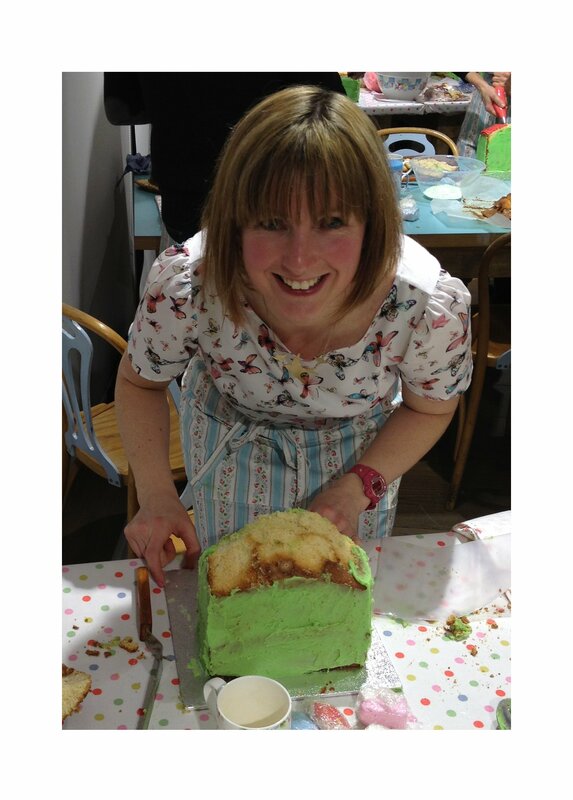 I’d always been obsessed with cooking and baking, and Baps & Buns was a welcome escape from post discectomy chronic pain and the perils of parenthood. What I didn’t expect was that quite a number of other things were about to happen to us which would push updating this blog very much to the back of the queue. It’s only now that I feel that I am able to, and that I want to, write about it in any public way on this blog. I must warn you that it’s all got nothing to do with cooking! First up was the death and subsequent delivery due to late miscarriage of our baby at 17 weeks gestation. The post mortem and myriad blood tests revealed that I suffered from the autoimmune condition Hughes Syndrome / APS, and it was this syndrome which was to blame for the loss of our precious son. Needless to say, it was a horrific shock and a terrible trauma to go through, something which altered us permanently from that point on. We were encouraged to try again, during what then became a horribly stressful time because our then 4 year-old daughter was in the process of being diagnosed with Autistic Spectrum Disorder, specifically Aspergers. The process of her starting school, something which should have been wonderfully exciting, was full of dread, and quickly became disastrous. And in the middle of all that, we were expecting another baby. Despite a treatment programme centred around Clexane, we lost the child, again at 17 weeks. The delivery and subsequent funeral (just me and my other half in the crematorium) were nightmarish in a new way. Those people who had struggled to find things to say to us first time reaaaalllllly didn’t know what to say when it happened all over again and the isolation we felt hit very hard. It was like a sucker punch just when you’d started to drag yourself up from the floor. It was hard to go on, but life relentlessly insists that you must; there’s no other alternative, especially when your only living child needs you. Despite our assumptions, our consultant was adamant that she could achieve “a successful outcome”, and batted away our fears about it all going wrong for a third time. One of our bereavement midwives had previously remarked that the only thing which made anything bearable for parents was the subsequent birth of a healthy baby and we had begun to feel that she was completely correct. Thus, with a very deep breath and no optimism whatsoever, we agreed to give it one more go. Life wasn’t about to let up. Our next shock was the loss of my beloved job. As I began the search for something new, there was always the thought in the back of my mind ‘but what if I get pregnant…’ – what a burden for a new employer. Looking back now, however, I am drawn back to the old cliche that everything happens for a reason. At the risk of boring you, I can sum up what came next: new job (amazing new boss), pregnancy (longest 9 months of my life filled with Clexane, aspirin and steroids), live birth at 37 weeks. I sit now in the living room of our new home and feel every single atom of my good fortune. We have an almost 6 month-old daughter, and even though we never ever felt safe enough to dream for even one second that she was going to make it – I’ll apologise to her for that in the future – I am beyond grateful for the healing and the peace she has brought us. Complications and losses absolutely do enhance the miraculous joy of a baby. Life is still testing and complex, and I can still find myself overwhelmed by the grief for the loss of the two precious children we will never have the opportunity to get to know. As our daughter’s personality emerges, I often wonder about just who we and the world have lost. The legacy of our troubles is varied; courtesy of 2 self-administered Clexane injections per day for 41 weeks, I now have a phobia of needles. But I am very glad to have been exposed to the work of the charity Sands and support groups for those with APS / Hughes, and will fundraise for them for the remainder of my life. So that’s what’s been going on. I now hope to be reporting from the frontline of our new oven a bit more regularly. And it’s a beauty. Seven rings on the hob…good things come to those who wait? An alteration in the treatment of my APS / Hughes Syndrome – more meds, many more meds – is rendering me seriously redundant at the moment. And that includes keeping me away from the kitchen. Unfortunately for my other half, that means that he has been subjected to lots of easy repeat meals and ready meals when he makes it in from work after a long day. I did make a major effort today to put together a slow roast lamb shoulder – not that it takes major effort, of course. I managed to serve him the lamb accompanied by red cabbage, green beans and roast potatoes. It might have knocked me for the rest of the day – I haven’t moved off the sofa since – but he was mightily appreciative of some proper home cooking. Since I have been slogging along, I have turned instead to my cook books and to my archive, reading through to find some recipes I have missed to tackle when I eventually get back in action. And I came upon something I requested from someone a long time ago, but haven’t yet shared on the blog. When I was young, I was looked after by a woman named Margo, an absolutely wonderful lady who I still call ‘auntie’ and visit to this day. Every day when I arrived at her house after school, I’d enter the back door to step right into a kitchen full of wonderful aromas and counters laden with home baking. In addition to whatever she was making for her own family that evening – my dad would have long picked me up before that was served – she always had cooling trays and tins of homemade buns and cakes on the go, including shortbread, drop scones, regular scones, fairy cakes (with the proper ‘fairy wings’ on top), plain buns with raisins or chocolate chips and, my favourite, her rock cakes. When I took my place at her kitchen counter, she’d let me have one of them halved and buttered along with a glass of milk. It was a really lovely regular treat, one I look back on fondly, and so a few months ago, I wrote to her to ask for the recipe. She was as modest as ever in her reply – “as you know I’m no baker” – but take it from me, she could whip up delicious treats in no time with no need for a recipe. She was an absolutely wonderful home cook. And she had included her recipe for my favourite rock buns along with her version of queen cakes plus the lovely mince dinner she’d given to me when I stayed with her during school holidays. I will keep the letter and the recipes in her handwriting for all of the rest of my life and I’m so chuffed to have them. She means the world to me and these simple little cooking memories are a surprisingly powerful source of joy. While I’m feeling a bit rough, I’m more than happy to indulge in this trip down memory lane. It was inevitable that I’d purchase another one of these enticing yellow boxes, given the success of the delicious cinnamon swirls (previous post). And even though we didn’t absolutely love the choc chip brioche (which just weren’t very brioche-y), they were still nice enough for us to keep the faith with Bake-It-Fresh. Thank goodness, because we’d have missed these lovely little pain au chocolat. Hats off once again to Jus-Rol for their ease and resulting taste. and unroll it to expose the marks where you’ll easily tear it into sections. After the choc sticks are in place, you simply roll in each end towards the middle and turn them upside down to place them on your lined baking tray. The instructions note that a little bit of glazing might be of benefit, so I used my trusty spray glaze – beaten egg or milk would of course do the same job. Twelve minutes at 200 degrees celsius (180 fan) later, and you have six luscious little pastry packages which conceal hot, melting chocolate. I’m just glad there are three of us in this house – 2 each and no fighting! Next week, we’re going to give the croissants a go. 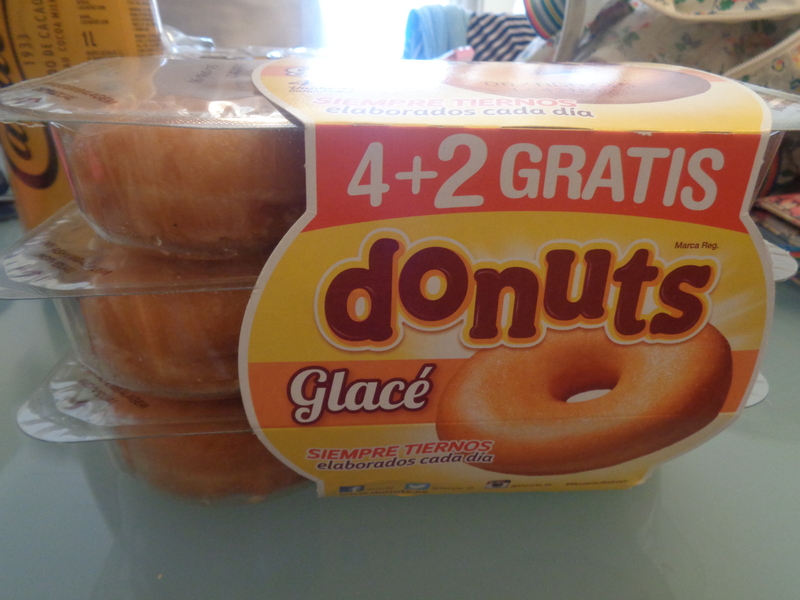 Here’s hoping they’re majorly yum. When I spotted these bright yellow packets in the supermarket, I instantly thought of those moments when we as a family fancy a homebaked sweet treat. And these would enable us to indulge in just that – without me having to do a lot of cooking and messing around, especially at the weekends when I prefer to sleepily stagger around in pyjamas for a few hours. I gave the husband the option of which we’d try first and he quite fancied a cinnamon swirl so off I went to preheat the oven. Then you cut in into six sections and lay them evenly on a lined baking tray or baking sheet. Then all you need to do is bake them for 11 minutes or so on the middle shelf of the oven. Final touch? A drizzle of icing, easily done thanks to the little pot of icing sugar which was also included in the packaging! The three of us demolished them in seconds. I grew up in a home where my dad did the bulk of the cooking. He got back from work first, so he’d have the family meal on the table by the time my mum arrived. It never struck me as unusual at all, and I learned quite a few tricks from him over the years. Now I do all of the cooking in our house – I didn’t marry a man who took after my father in that respect! There are times when I think back to dad and all of his hard work, especially when I end up throwing together something in the kitchen that has come straight from his textbook. One of his key puds is apple crumble. When we had rhubarb growing wild in our garden, the pinky batons were his favoured filling but now it’s apple all the way. I think he averages two a week, and my mother regularly requests a few to be given to her friends, fellow charity shop volunteers or just a stranger she meets – almost. Northern Ireland is THAT friendly. The cooking apples which came my way recently did end up in my kitchen in a very Norn Iron fashion. Walking back from our local post office, I happened to smile at an older gentleman coming the opposite way, a habit I’ve almost grown out of after almost 13 years living in the semi-hostile standoffish south of England. Obviously deeming me worthy, he stopped abruptly and said, “Would you like some apples?”, gesturing to three plastic bags he was holding. Offering him a pot of chutney or apple-related treat in return – which he refused – he then encouraged me to take a few apples from the bag, explaining that they’d come from his daughter’s garden. Off I trotted with my bounty, and, feeling too knackered to make anything elaborate / I’d have to think about, I set about putting together a basic crumble a la dad. 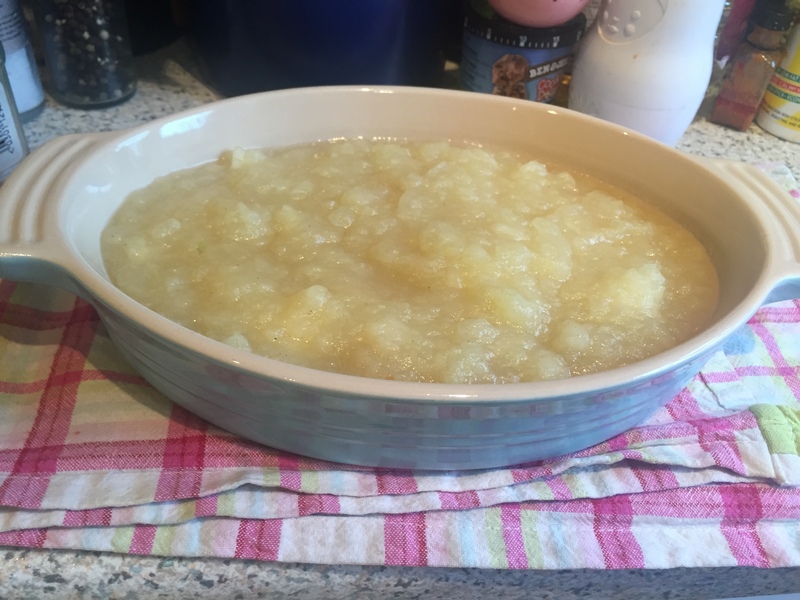 A soupcon of apple carnage later, I put the cubed apples into a pan with a little water and caster sugar. 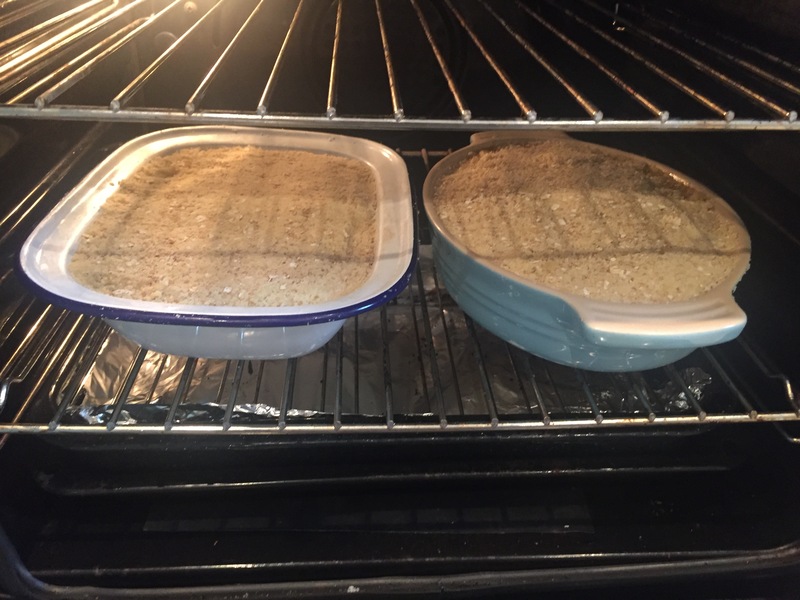 After adding a pinch of cinnamon and nutmeg and whipping up a batch of crumble topping – flour, butter, rolled oats, demerara sugar (added after you rub the butter into the flour, obviously) – off my two crumbles went into the oven for 40 minutes at 160 (fan). I ate a large portion afterwards with some custard made from Bird’s powder. It was a comfort on a rainy, rainy, autumn day – and definitely a taste of home sweet home. Once we finished picking blackberries this year, almost immediately we made the move to apples. Friends passed on a bag of the first fruits to fall from their tree and so my mind turned initially to crumbles and tarts and then to chutney. 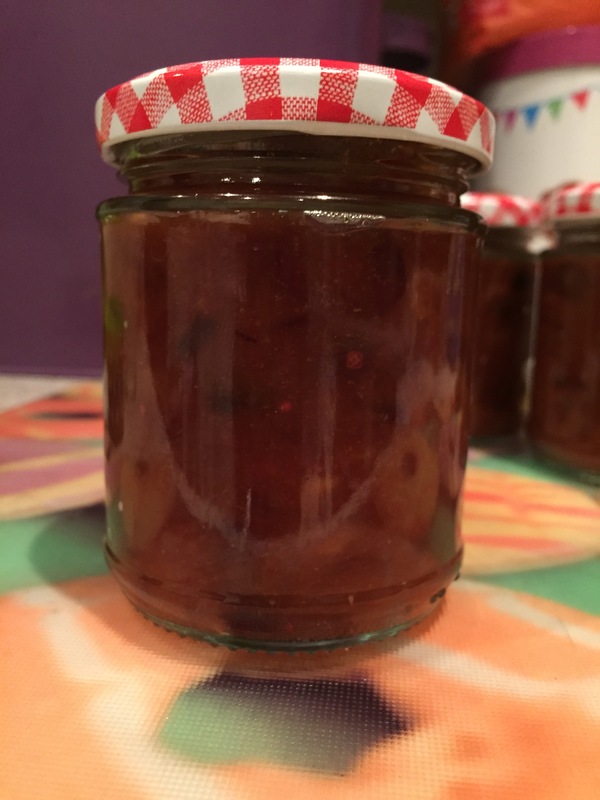 Chutney is one of the nicest things to pass on as an edible gift and one recipe in particular seems to get most favourable feedback from those we give it to. Another plus is that it’s extremely easy to make in one pan on the hob. It’ll be no surprise that it’s a Nigella recipe, given my devotion to the domestic goddess, and it comes from her excellent Christmas book. 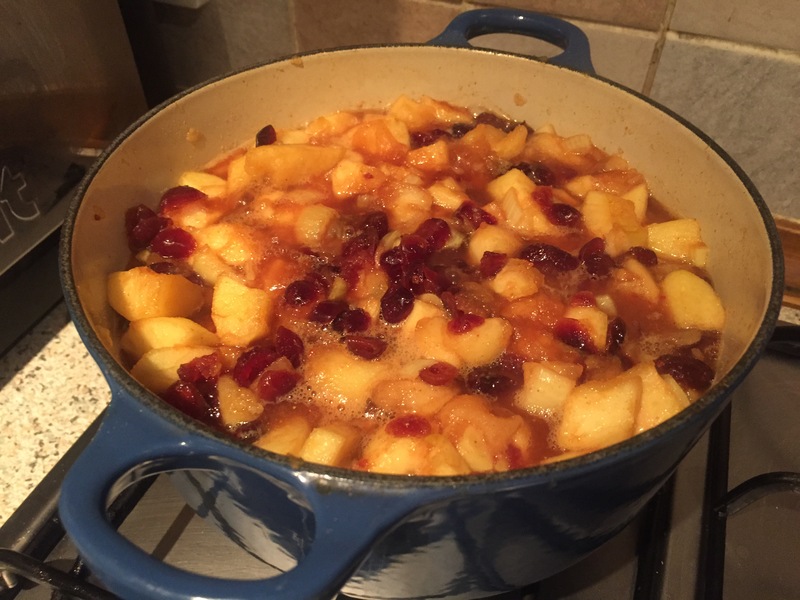 It’s a simple mix of cider vinegar, onion, cranberries, apples, seasoning, sugar and spices, and takes just 45 minutes or so to cook. 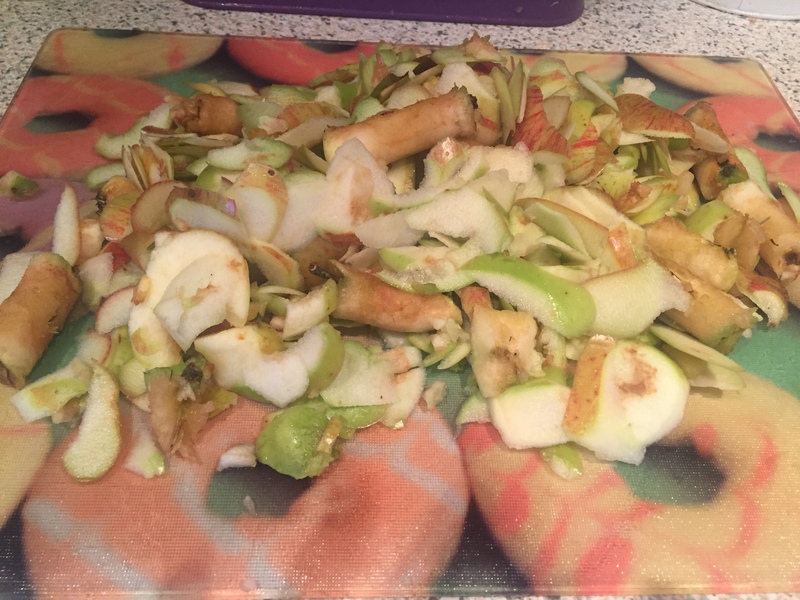 Once the apples have broken down, it does turn into a lethal spitter – watch out for those volcanically hot sparks flying out as the chutney simmers – but given the rest of its qualities, we can let it off with that! I love this chutney so much that its page in the recipe book is pretty dirty (always the sign of a favourite) and I have made it three batches so far this autumn. Practically every jar (we have eaten a few ourselves) has gone to a happy recipient and, once I get my hands on some windfall apples again, I’m sure it’ll be on the boil and bubble again. We’ve just got back from two weeks on the Costa del Sol, and, as ever, a highlight of the trip was my usual trip to the supermercado to see what interesting or quirky things I could bring home. I don’t mean serious stuff like the finest serrano ham; I’m talking more about silly nostalgic treats, and anything else interesting. i was most keen to source the two items which remind me of the couple of trips I made to Spain as a child. I can vividly recall swimming up to a barstool with my dad for a treat of chocolate milk and a doughnut and I can also clearly picture the packaging of both items as they were handed over. 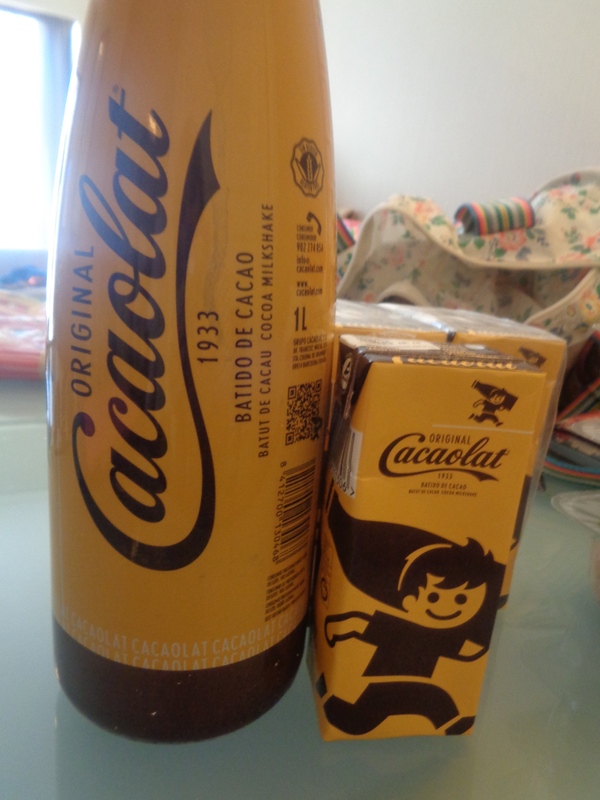 The milk I remember so fondly is Cacaolat, not the seemingly more popular Spanish brand Cola Cao and I was delighted to get my hands on it, and on a multipack of the doughnuts, in a larger store. To my eternal delight, neither the appearance of the milk nor the doughnuts has changed much in the 30 or so years since I devoured them as a child – and that taste, oh that taste, was just the same. I couldn’t resist eating and drinking them throughout the holiday – and bringing a few back packages and cartons back to help with the post-holiday blues, too. Among the other treats in my shopping basket were wonderful Inez Rosales tortas, chorizo and two little 47c mineral water bottles with cutesy Anna and Elsa wrappers for our daughter. 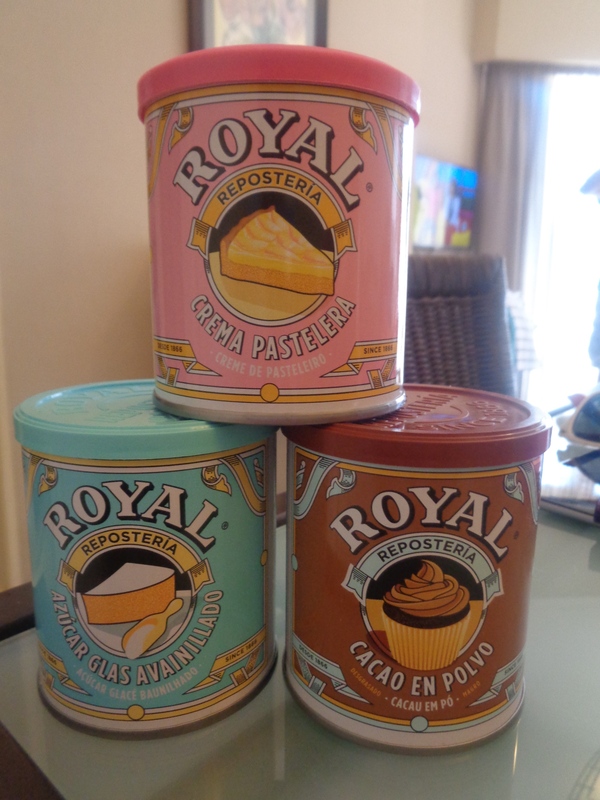 And then I came upon the trump card of the trip, a trio of perfection in the form of three Royal reposteria tins: cacao en polvo (cocoa powder), crema pastelera (custard powder) and azucar glas avanillado (vanilla icing). My mother laughed at how excited i was when I spotted them in the baking section, but all I think of was my little red Royal baking powder tin at home and how delighted it would be to be joined by such beautiful little tins. I’ll have to get someone to translate the back of the tins for me so I can fully appreciate them, but I know that, once their contents are gone, I will be able to refill them and reuse them for years to come. What I'm cooking - usually inspired by my Northern Irish upbringing - eating & reading!